Part 1 Morning Formula: For the first 3 days, take 1 capsule each day in the morning on an empty stomach. Part 2 Evening Formula: For the first 3 days, take 1 capsule each day in the evening on an empty stomach. Part 1 Morning Formula:: After 3 days, take 2 capsules each day in the morning on an empty stomach. Part 2 Evening Formula: After 3 days, take 2 capsules each day in the evening on an empty stomach. "With only 6 days left of the cleanse program, I got my liver enzymes checked & my #'s were lower! 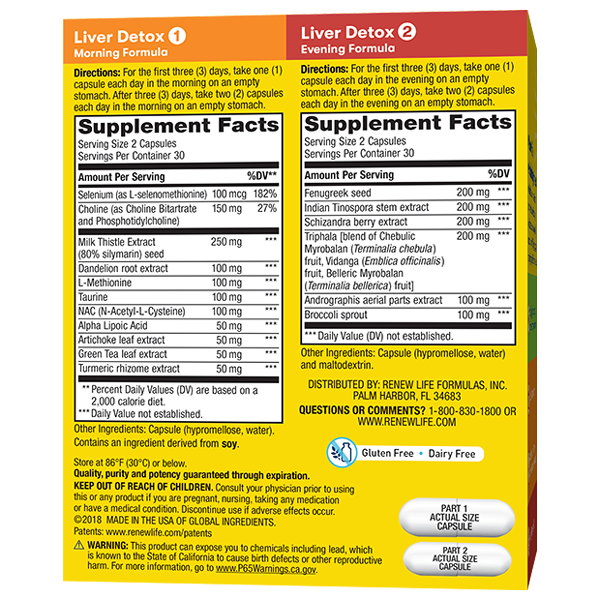 This product does work at lowering liver enzyme lever!" 30-day 2-part program, Organ cleansing program*, Supports liver health*, Eliminates waste and toxins*, Gluten free.